Hero's life became a mess all of a sudden, and when she least expected her past came back to haunt her. Just a short drabble based on a song. This is a brief story about revenge. The prey and the victim's names are not included. She's always been a safe bet. The go-to girl. No expectations, low risk. But this time around it's getting harder not to feel sorry for herself. A girl and a Homeless Man with Violet eyes find a common place in a cafe Called Melancholy. Too much Beauty Can Be deadly. Rivert City's Make up Company is going big with their new Line. 'Slyvia's Secrets' named after the owner's granddaughter Slyvia who indeed has her share of secrets and skeleltons lets be frank bodies in her closet. But this makeup line is unusual. Why are people going missing? That's where Zyra Comes in, She is hired to find out things But whats going to happen when she finds out the truth about everything about the Luxurous Makeup Company and Its Dark Family? OR better yet with her sanity? Short Stories/Drabbles between Ororo and Thor. Marvel!Universe. "So...thou art the Goddess of weather?" A series of letters from Him, to Me. Disclaimer: All publicly recognizable characters, settings, etc., are the property of their respective owners. The original characters and plot are the property of the author. The author is in no way associated with the owners, creators, or producers of any media franchise. No copyright infringement intended. Terry Cusick has spent the better part of his adult life locked away behind bars, accused of killing his lover and her family. As he counts down the endless days of his perpetual confinement, he reminisces on the one girl who had changed his life drastically and how their star crossed love affair was more blessing than curse.-Based on the We Original Series "The Divide"
The Keybearer has vanished, and the darkness is spreading beyond the rifts that connect each world. Without the Keybearer...darkness is consuming worlds without mercy...someone new must wield the Key. Enter Ariel Rance, average college student completeing her first hectic year of college in the heart of New York City. With her best friend since childhood, Michaela Yuri, Ariel has dreamed of traveling the world to escape the constraints of everyday life. However, when an out-of-place hurricane hits NYC, Ariel's normal life takes a quick turn. The fate of the universe is now on this stylish 19 year-old's shoulders. He didn't want to be just "Edge",the captivating ,audacious,antihero superstar who everyone knew and grew to love in the WWE.He preferred to Adam , the more reversed , doting husband, and intuitive person who made a indention on her heart. Kenya Tiana Smalls-Copeland is deeply in love with husband, and is terribly missing him. This one shot of their passion induced night . What happens to a woman when the thing she dreams of becoming as a little girl, the thing she revels in as a young woman, is suddenly the thing that she must learn to let go of and live without? Is there a place for her in a world where this thing is the only thing that matters? Is it even something that she ever really loses? Warrick Mungo was a senior in college at Wolfpax University. Son of the Alpha Rex, or Alpha King, he enjoyed all of the benefits of his position as Royal Enforcer and Captain of the Claw Ball team. He was the youngest of fourteen sons. Why did he have to be the one to receive the Alpha Rex gene, anyway? It was always the eldest son of the Alpha Rex and his true mate. Everybody knew that. Warrick just didn't understand how his parents expected for him to put any effort into locating his mate so that he could settle down, when there were so many interesting flavors still left to sample. Then there was The Problem. The one that seemed to unnerve even his father. Everyone thought that if he just found his Regina, his balance, The Problem would be automatically under control. He isn't so sure that just meeting his Regina will make everything right. What if she fears him, too? What if his responsibilities put her in danger? All he knows for sure is that he's not ready to meet her...yet. Thandie was in a category all her own. A certified genius of geniuses, she had come to the university on a mission to find her purpose in life. You'd think that four PhD's would have done that already, but no. She was bored again, and a bored Thandie was a terror that her Alpha simply could not allow. So when she turned eighteen, he sent her to the territory of the Alpha Rex while she attended Wolfpax U. Socially awkward, overweight and haphazardly dressed, and then there's The Other Part that shall not be named outside of the pack house. Let's just say that she had always stood out. Her pack, and her Alpha, always loved and protected her tender and loving heart. The Alpha even sent fifty Enforcers to University with her just for her protection from...well her own clumsiness for starters. They were also in place to stop others from discovering...well, The Other Part. How will she cope with leaving home to go away to school for the first time ever, without her beloved brother, Theo? How will she cope with the path she must walk to get there? Moreover, is she ready for the possibility that she will finally meet her mate? *Note: When I finish it, This Book Will Be Published. If someone offers me a contract, I will not finish posting it online. I'm sorry for any disappointment this may cause, but I really believe in this story. I hope you guys will support me, anyway, and help me to polish it until it shines. Aaliyah Wyndham is a twenty-seven year old attorney working in the field of Entertainment Law. She has had a crush on her next-door neighbor, C.E.O. Gabriel Cortez, for over a year. Following a break-in, the two share a romantic interlude that seems quite promising, until Aaliyah realizes that Gabriel doesn‘t realize who she is! Aaliyah decides that for his oversight, she wants to make Gabriel pay, and make him pant. There is only one problem with this plan: Lucas D'Alessandro, her best friend since childhood. He’s been Aaliyah‘s “Big Brother” for so long that she never notices when she begins to feel decidedly unlike his sister. Meanwhile, he is facing the same quandary, struggling to decide whether to pursue a more intimate connection with Aaliyah or to leave the field clear for someone else, namely Gabriel. Shall Aaliyah rest her case with Gabriel, or shall she make a motion to Amend her Heart with Lucas? This is a sweet romance story. It has been published, and so this is only an excerpt. This story takes place when Aaliyah Wyndham is a twenty-year-old intern, working in Los Angeles for the summer while staying with family friend, Lucas D'Alessandro. Lucas seems to have gone a little Hollywood since he left South Carolina. It's all about the girls, the cars and the money. How will Aaliyah enjoy living with L-Money? There there is the mysterious guy she meets while waiting at the airport. She's surprised to find that he isn't some sarcastic jerk after all. He's Fuminori Kawaguchi, someone whose friendship she thought lost to her a long time ago. The two will renew their acquaintance as they bond over the summer, when they're not both working towards their futures. Their summer romance is complicated by Lucas' overprotective nature, and by his rampant hypocrisy. I mean, how many women will Aaliyah have to watch him turn away at the door before he stops shadowing her on dates? Doesn't he understand that she's all grown up, now, and that she can handle herself? How will she cope with the unwelcome fame that comes along with being The Next Big Thing's apparent love interest? Will Fumi continue modeling, or will he return to his studies, and pursue the future his family expects of him, the future he's always thought he wanted? Most of all, what will happen in the future? Is this just a summer romance, or can their hearts stand the test of time and distance? Find out in A Summer Heart. This story is a free prequel to Amended Hearts, but is a standalone. You do not have to read Amended Hearts to understand this story, but you may want to read it, anyway, to find out what ultimately happens to Aaliyah. It may be published, but will remain free to read in its entirety. Why aren't more of the talented authors from Valentchamber receiving the accolades they so richly deserve? The answer is simpler than you can ever imagine. 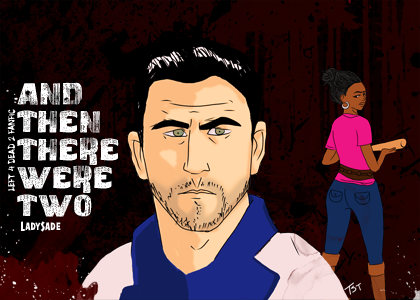 With the death of Coach and the pending fate of Ellis hanging in the balance, Nick and Rochelle must face the harsh reality of what it means to live in a Post Zombie-Apocalyptic World. Disclaimer: Coach, Ellis, Nick, and Rochelle and all characters, unless otherwise mentioned, belong to Valve and Left 4 Dead 2. They don't belong to me, I just like creating fan art and fan fiction about them.